Tastes right out of Arabian Nights! Our fruit-and-nut candies are actually derived from locoum, also known as Turkish Delight...a beloved delicacy of the Near East. Made since the 15th century, the aromatic flavors of these timeless treats have been celebrated in literature, music, and performances around the world. 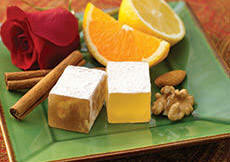 Now we've crafted our own version of Turkish Delight using some of the traditional flavors which made it famous. Each box includes Orange Blossom-Almond, Rose-Pistachio, Apricot-Walnut, Vanilla-Pistachio, and Nut-Free Lemon Delight candies. 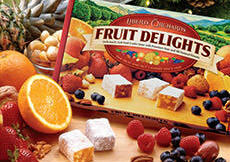 Turkish Delight makes a magical and memorable gift for those seeking out new tasting adventures! Kosher. INGREDIENTS: sugar, corn syrup, nutmeats (pistachios, walnuts, almonds), modified corn starch, pectin (pectin, disodium diphosphate, sodium polyphosphate, dextrose, dicalcium phosphate), apricot juice concentrate, apricots, natural flavors, sodium citrate, citric acid, malic acid, black carrot extract (for color), soy lecithin. So yummy, they didn't last a day in my house. Flavors were intense without overpowering. Texture was perfect. Exactly what I wanted and even better than I expected. Turkish Delights are light, lively, and subtle. They are worth trying, and I'll bet you'll be back for more! If you're like me, you've given up buying loukoum off the shelf of most stores: what you get is usually stale, overly sweet and the texture of stones. But not Liberty Orchards Loukoum! Soft and full flavored, it's our new go to for Turkish Delight. LO's turkish delight candy is absolutely addictive. It's the best version I've found in this country. I have to exert considerable restraint to keep from eating a whole box within one week. It's delicious. I'm afraid to try a box because I hate the taste of Rose, Lavender and other flowers in my treats. This year for Christmas gifts I treated a few friends to the treat the Winter Witch gave to one of the children from Narnia...Turkish Delight. I told them all about the movie and then the candies. They were all pleasantly surprised. This candy is better than any other Turkish Delight available in the States. It is full-flavored, and its texture is perfect. Plus, Liberty Orchards' customer service is first rate. I have only the highest praise for the company and the candy! a gift for the holidays...it was AWESOME. 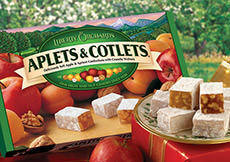 My parents love Aplets & Cotlets even though diabetic, ditto family. Luckily I searched online and found your website and the Turkish Delight was on sale for Mothers Day so I ordered four boxes for them in California since I'm far away. I informed my sisters and mother over Skype to be at home to receive it. I ordered it online Friday and it arrived Tuesday. They were happy sharing it in time with visiting family from Desert Hot Springs. This is my second time ordering Turkish Delights and I was not disappointed. They are absolutely delicious with their delicate fruit flavors. Just wish they were a little bigger. I plan on buying three or four boxes of these because they never last in my house. They're gone within hours. The flavors in this assortment are awesome! I'll be buying more! 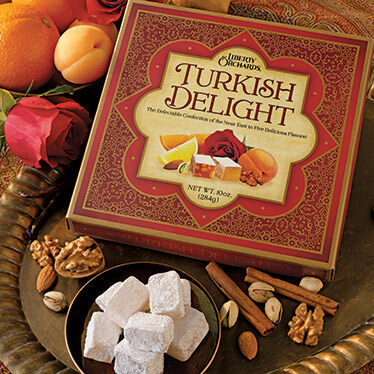 Remember the Snow Queen in Narnia and her treats were Turkish Delights? Here it is from virtual to reality Turkish Delights. They take you to another world. So delightfully delicious. Thank you Liberty Orchards. 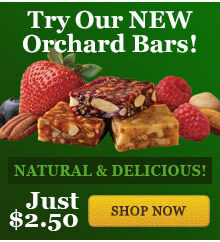 Just the right amount of sweet, plenty of nuts for a good consistency, and flavors right from the Old World! The only flavor that needs a little work is the Rose-Pistachio -- I think it's the only time I've ever not gone back for seconds. The flavor balance is perfect on each type of delight. Very fresh and tasty. I received a box of these as a Christmas gift and they really were delightful. So fresh and each one so very good. The packaging was also pretty. It made for a perfect gift. Now I am looking at all of your goodies here on your website and trying to decide what to try next. I am sure I will not be disappointed!